My name is Daniel Molina. 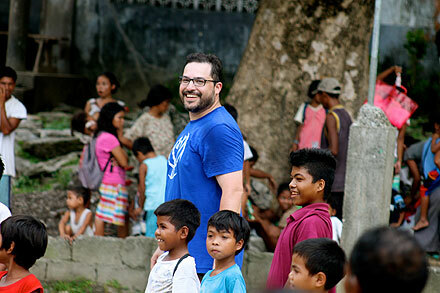 I had the privilege of traveling with a small group from Texas to the Philippines to assist at the Ruel Foundation. This was my first mission trip and an experience that I find hard to put into words. I often say it was one of the best and worst things that I have ever done. My life is forever changed, and for that, I am eternally grateful. My initial intention was to go help others; in the end, I believe I am the one who was helped the most. I have become a new person. I see the world through a new set of eyes and feel with a different part of my heart. I have already begun to plan for my return trip to Ruel in 2016. It’s an amazing journey and truly transformative. We are all called to be the hands and feet of the Lord. If you feel that this is your calling, you will find a place at Ruel. To those of you who are thinking of traveling...go. To those of you who wonder how you will help…you will in ways that are hard to comprehend. To those of you who wonder if you can afford it…it’s the best thing your hard earned money can do. To those of you who worry about your health and safety…you’ll be okay. To those of you who have wanted to take part in international mission work but have put it off year after year…this is your time.